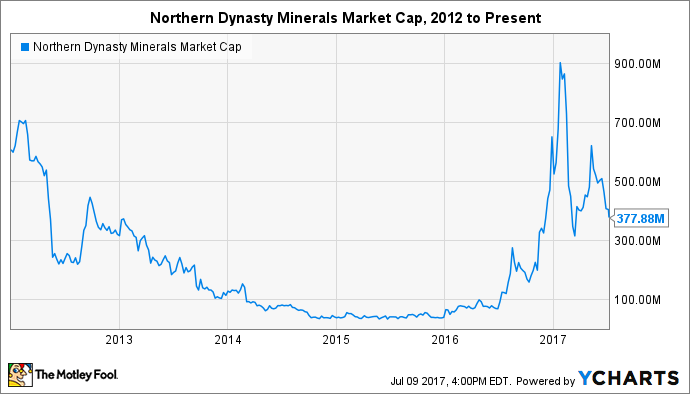 Where Will Northern Dynasty Minerals Be in 10 Years? The mining stock has reawakened since Trump was elected, as investors bet this time really is different. This article was updated on July 9, 2017, and originally published on Feb. 1, 2017. Canadian mining company Northern Dynasty Minerals (NYSEMKT:NAK) is sitting on one of the world's largest undeveloped deposits of copper and gold. There is one minor detail, though: It hasn't done much mining. That's because the U.S. Environmental Protection Agency nixed the company's plans to develop the Pebble Project in Alaska in 2014 after ruling that it could threaten the world's largest sockeye salmon fishery. That decision pushed the stock below $0.50 per share for the next two years and forced previously committed partner Anglo American and investor Rio Tinto Group to abandon ship. What a difference a few months can make. The election of President Donald Trump, who favors fully utilizing American resources, has quickly reversed the fortunes of Northern Dynasty Minerals. Shortly after the inauguration, the company disclosed that it had the administration's support for development and would reach a solution with the EPA within 100 days, which it did. It also believes it could find a new partner (or consortium) before year-end. The sudden and unexpected shift in policy pushed shares to a market valuation of $900 million -- the highest since late 2011 -- before the stock slid back to half that. NAK Market Cap data by YCharts. Investors are probably wondering where the stock will go from here. Given the lengthy permitting process and development timeline, it's fun to wonder: Where will Northern Dynasty Minerals be in 10 years? To be fair, everything still hinges on whether the company receives approval from the EPA. That's not exactly a given, as previous decisions cannot simply be undone by a pen stroke -- even by a president. The good news is that the new administration has made good on its promise to smooth over past regulatory hiccups at the federal level, while the Alaska Department of Natural Resources has worked with the miner to ensure it doesn't stand in the way of progress. Today, the company is in the midst of the permitting process, which Northern Dynasty Minerals expects should consume $150 million and four years. The hefty price tag and complexity makes it necessary to find a deep-pocketed partner. After all, even after raising net proceeds of approximately $35.5 million in a stock offering in early 2017, the company is not in a great financial position to undertake such an enormous task by itself. At least, not without significant dilution and/or debt. Data source: Northern Dynasty Minerals' 2014 estimate. If engineers prove these "resource estimates" with higher levels of confidence, then the company could upgrade its figures to "reserves," which have several subcategories of their own. Assuming the numbers in the table above are roughly accurate for Pebble Project's long-term potential, it will take years to ramp up and scale production to meaningful levels. And even successful development doesn't guarantee profitability. The most important factor in the mining industry is all-in cash costs, which includes labor, equipment, energy, transportation, regulatory, and consumables, among other expenses. Pebble comprises 23,000 square miles of land that is home to just 1,500 people. American labor and regulatory costs will already increase production costs, but the rural nature of the project hints that infrastructure, energy, and transportation costs will be significant as well. Consider that Barrick Gold (NYSE:GOLD), a $20 billion company with extensive gold-mining operations, extracted 5.5 million ounces of the precious metal last year for an average cost of product sold of $800 to $850 per ounce. However, production costs were significantly higher for its American mines in Nevada than elsewhere in the world. And that's in a state that is the world's sixth largest gold-producing territory. Nevada is also home to more developed infrastructure and fewer environmental burdens than Alaska. Moreover, the company's main assets there -- Cortez and Goldstrike -- produce ore containing two times and three times more gold, respectively, than exploratory work estimates that Pebble contains. Taken together, these factors mean Northern Dynasty Minerals could see production costs north of $1,000 per ounce. Northern Dynasty Minerals has a long and difficult road to resource extraction and profitable growth. To match an industry leader such as Barrick Gold, the company would need to produce millions of ounces of gold each year for many consecutive years, in addition to large amounts of copper and silver. While that's feasible on paper, investors should probably remain very patient with the owner of Pebble. A long permitting process, the high costs of development, and unknown cost profiles all present major risks to investors.